"What we have here is a marketing tool that taps into all 4 dominant learning styles, engages and converts people at high volume, and leaves them with a story they actually want to share with others, without sacrificing that heartfelt connection that is oftentimes missing from technology. Augmented Reality brings everyday objects to life, and the conversion rates cannot be ignored. D: Hey Everyone! Welcome to Craig Dustwald’s Rock Your Life TV Series where we interview amazing business leaders and innovative entrepreneurs. I am guest host Dean Cain and today I’m here with special guest Michelle Calloway, welcome to the show Michelle. M: Thank you Dean for having me. D: Yeah absolutely. I had no choice. You were booked and scheduled here. So Your company is called REVEALiO? And you’re a technology company “augmented reality.” Now I have a kid, he’s a gamer. The only AR I can put in there is like VR. Now what is you AR please? M: So AR is very similar to VR actually, they are like cousins. Where VR takes the user and completely immerses them in a virtual world, usually with those little headsets, AR allows virtual content to be overlayed real world objects so that you’re not taken out of your real world environment, but you’re able to view virtual content. Think of Ironman. D: Sure. Ok, like he has these little Ironman - I mean he’s not the best superhero, let’s be honest, he’s really good, but he’s not the best though. He’s fantastic. And Robert Downey’s great. That’s what I’m saying. But Ironman has that little face shield and he can still see. So if I had something like that - is there actually a...? M: Well in his instance, that’s a heads up display (HUD). But like when he’s down in his garage working with Jarvis and he’s able to see all those things and pull them out in space and does these things with it, that’s a form of AR. Now I just want to share a little bit about the space right now because augmented reality (AR) is super hot. D: It’s insane. I was at E3, which is that big electronics situation. VR was a huge deal, and people were talking about it. Like I said, I have a gamer son, so there’s all that stuff going on so please share some space. M: Well Tim Cooke CEO of Apple actually just proclaimed in 2017 that AR is bound to as influential to our society as the smartphone. M: As their act 2. Because they believe so much that it is now going to be their focus. And Apple is also putting a tremendous effort in. They’re both providing development platforms for AR as we speak. D: Well Apple just celebrated the 10 year anniversary of the iphone. Which everyone thinks has been around forever and it’s only been 10 years. M: I know, things are moving very quickly. What we’re doing with AR is really bringing it down to a minimalistic level to allow small business owners to capitalize on it. And what it does is that it allows others to captivate an audience and influence their buying decisions. Take them through a buyer’s journey in less than 60 seconds. D: Well so does that mean you’ll be at your computer screen doing one thing? M: No! What we’re doing is that we’re allowing them in the real world to have elements of their marketing like something as simple as a business card or a banner at a trade show could come alive with virtual content when viewed through our mobile app. I would love to show you. D: Show me! You can actually demonstrate this! Prepare yourselves, I’m excited for this. M: This is an example of a business card. I’ve programmed this image to be recognized by my app. So when the app actually sees the business card through the app, virtual content appears. In this case, I used a video because video marketing is really hot right now, and it actually tracks with the card. You see how overlaying over it. So you’re able to captivate your audience, and then you’re able to connect with them in a warm way by putting a face to your brand, and then you’re able to engage them visually with your message of your product or service. So you’re able to take them through the entire buyer’s journey in a matter of 60 seconds. And it taps into every dominant learning style that we have as humans. D: Okay, I host a magic show so I’m just making sure there’s nothing weird in this. And it looks totally and completely normal. So is it an app? M: So the app acts as the AR viewer, where as in the VR world, you have to put goggles on. In out AR would, you would wear wearables, like glasses. But in our case, not everybody has those yet, so we’re just making it simple to view through a free mobile app. Our REVEALiO mobile app is what you use. M: In your real world environment, just open up the app, and if you can tell that something has been activated, yes. M: It can be anything. Any logo, we can make any logo come alive with content when it is viewed through the mobile app. D: So I’ll be in New York next week, I’ll be in Times Square. And there are things up on the walls, and those big signs and things, is that something we’d be able to do something? M: If they came to us and had us program them, yes. D: Oh my, gosh, this is going to happen people. Holy Smokes. M: I get to bring this to small business owners because small business owners need to have a foot in the game as well because normally, this technology is so unobtainable or unaffordable or what not. Our focus is to make it so simple and easy and affordable to use. Bring us your content, your video marketing, and we’ll marry it to whatever your print materials are and bam, you’re able to instantly stop people in their tracks. You become the rock star in their eyes. I want to work with you is what they’re going to say. D: That is unbelievable! I see you have other things here. So what are the other things that we have? M: Well I wanted to explain why I’m doing this technology company because I do believe it was a call that was placed on my life. Normally you would see something like this and you would say; ‘Oh! That’s really cool!’ You’d be impressed, then you’d go on with your life. Well not me unfortunately, or fortunately, when I was introduced to this in 2012, I was unable to sleep for 2 straight weeks. My brain was lit up all kinds of colors. I kept thinking of all the different use cases and my mind was just literally blown. But the way I’ve come about with with REVEALiO and the use case that I’ve developed with this company actually was brought on by a young girl that saw that I could make things come alive. She had fallen in love, but her boyfriend was deployed overseas in the military. So she said; ‘Michelle would you help me create a greeting card that I can send to him that he can hear me and see me anytime he wants?’ So we created this beautiful little specimen of a greeting card. And when he received it, he felt very touched that she would send him such a nice greeting with her beautiful face on it. When he viewed it and it came alive and she started talking on the card, he said it rocked him to his core. He said it made him feel that the distance just shrunk up and that she was right there with him. He folded it up and put it in his wallet and carried it on his person everyday while serving abroad, so that he could feel that she was right there with him. When I saw that power of human connectivity, I knew I needed to get this into the hands of everybody. No matter what the budget, that’s where my passion comes in, working with small businesses, because I don’t want them to be left out of this incredible connective power. D: So it’s not going to be horribly expensive for someone with a small business. Lot’s of times its cost prohibitive to get involved in something that’s that dramatic. M: We work with small businesses, and we work with nonprofits. We’re all about getting this into the hands of the people. This is just going to go ka-boom! And I want everybody to be a player. D: So do you have to have wi-fi in order to watch this? D: And so I won’t have to read anything? Just asking, I don’t mind reading. So literally this will come alive here. You’ll talk to me here. M: Yes, I will talk to you on the front cover of the book. D: Wow, that’s amazing. And this is all for business applications? It doesn’t just have to business either, it can be anything. M: No actually we have a REVEALiO greeting card app you can download and create a greeting card like this - a birthday card, an anniversary card, and say what you want to say and they will be able to see it come alive when they get it. A printed card gets delivered in the mail for them. M: Well I started developing with AR back in 2012 when it first became a little more mainstream in the United States. It’s been in Europe a lot longer than that. People weren’t quite ready for it back in 2012. When they’d see things come alive they would back up and say, what is that witchcraft or voodoo? Now since the release of Pokemon Go in 2016… that did so many great things for the face of AR. In 2017 so far, we’ve got facebook announcing that they are going to be developing a platform for it which is huge for the world of AR. They predict that it’s just going to pass VR because of the fact that you don’t have to be taken out of the real world environment. So we’re super excited. I mean what I’m doing with it, is so very basic, but video marketing right now is so powerful so I’m just allowing people to take their video marketing and marry it to anything that they are putting out there in the real world to physical tangible objects even, and make them come alive. Like a hat with a logo can come alive with a video. D: Madness. Phenomenal. I… How do I get involved in the bottom, of the ground floor, is there a way? Let’s talk! Seriously. M: We’re a new tech startup and we need support. I’m a female tech founder and that’s kind of a rare thing so I would love to get some really great backers. D: I think you will. I have a funny feeling. That’s pretty amazing. There’s one little thing we like to do here on the show. It’s called Rockstar Rapid Response Questions. It’s just so our viewers can get a little bit of an idea of who you are personally as you are the female tech CEO. So it’s quick questions I’ll ask you and we’ll get quick maybe one word answers. And we’ll learn a little something about you and maybe how we can get in touch with you to get in on that ground floor. Are you ready for this? M: I am ready Dean. D: Okay, what is your favorite band? D: Good call. Yes, I’m with you. Favorite song? 11:19 D: Let me ask you for real, just kidding. Are you a morning or a night person? D: Ah yes of course. Where would you go if you were invisible? M: That’s a weird one for me, you know all I can think of is that I really love the ocean so, there’d be like coral reefs, hanging out there like in SeaWorld. D: What is your favorite food? M: Potatoes I found out! I love potatoes! D: Me too, I love them to death. Biggest fear? D: I’m with you there. I don’t like snakes either. Any particular word that you love? M: Actually, I love the word love. It’s all encompassing. D: Conversely, what word do you hate. D: On a scale of 1-10, 10 being the coolest, how cool are you? M: Oh well really, I think I’m pretty hecka cool. My kids’ friends even think I’m cool. I think I’m about a 9.74. D: Ah, I’ll give you a 9.75. If your kids think you’re cool, you’re cool. And lastly, if you explain who you are in one word, what would that be? D: I will go with that completely. Now how would someone get in touch with you if they want to learn more about REVEALiO? M: Yes, REVEALiO. Go to my website, revealio.com, it’s the word reveal-io. It means to reveal things magically. You can go to my website to learn more about all the different use cases that we can use this technology to help your business and to help you be able to stand out, stop people in their tracks, and captivate them and influence their buying decisions. You also can reach out to me at info@revealio.com if you’d like to email me. We can set up a free 30 minute consultation. You can go into the app store and download the REVEALiO app and begin playing there. We also allow you to create your very first AR greeting card with REVEALiO greetings for free. And send it to anyone, anywhere in the world. Your first card is on us. So I look forward to talking with you and working with you and reach out to revealio.com. D: So could I watch her card if I had the app right now? M: Yeah, I can show you right now if you wanted to. She’s going to show me, and we’re going to go to a commercial break right now. As soon as I watch this. I want to see what’s going on here… (gasps)... amazing…. Oh my gosh!! Ah! Amazing. Amazing. Very well done, thank you. That’s incredible. Kevin: Hi, I’m Kevin Harrington, an original shark from the hit TV show Shark Tank. I have special guest Michelle Calloway. Michelle, welcome (shakes hand) good to see you, and for everyone out there today, tell us about your business, who you are and what you do. Michelle: Well my name is Michelle Calloway as he said, and I am the CEO and Founder of REVEALiO. It means to reveal something magically. It is an augmented reality video marketing company, that can take your company from 2D to 3D by making your brand COME ALIVE! Michelle: So you’ve heard of virtual reality? So what augmented reality does is allows us to have virtual content appear in our reality, our real realm. Michelle: Have you ever heard of Pokémon Go? Kevin: Sure! It had 50 M downloads in 15 days, I know that. So that basically helped put augmented reality on the map. Michelle: So what REVEALiO is doing is focusing on how we can use augmented reality wisely, as a marketing tool for business owners. Kevin: Wow. I love it. Kevin: Yes, I love it! Michelle: But, now let’s bring that same power offline and allow them to instantly illustrate who they are, what they can do for somebody, and the value that they offer. Kevin: Fantastic! I’ve done a lot of research on this because Pokémon Go was so successful with all of the downloads. But, there was really no business application to that. You created augmented reality in a business application. Kevin: By the way, I can tell that you’re very passionate about this. What is it about your product, and I want you to show it to everyone out there in just a second, but I need to ask you how did you come up with creating an augmented reality app? I mean your passion is unbelievable. Michelle: Oh yes, I’m very passionate about it and here’s why. First of all, I am a graphic designer with a multimedia background. When this technology was introduced to me, it literally flipped my life upside down. I couldn’t sleep for two whole weeks. If you were to put my brain under a CAT scan, it would’ve been SO many colors! And so, I felt like that it was a calling. Michelle: When something grabs you that hard, and doesn’t let go, it feels like your meant to do something with it. And so I pursued it. I learned everything I could about it. And then a young lady came to me. She saw that I was able to make images and objects come alive with virtual content, and she had fallen in love with a soldier, deployed overseas in the military. So she says, can you help me create a card we can send to him? That way he can hear me and see me anytime he wanted. So I was like, oh, I got chills all over my body. So we put something together, she shot a little video on her cell phone, and we put it together and sent it to him. A physical card. He received a physical printed card, and when he watched her come alive on the card, he said it rocked him to his core. This was a 19 year old man, right? A young man saying it rocked him to his core. He said the distance just shrunk up between them, and he felt that she was right there with him. Michelle: Then he carried it with him on his person everyday while serving, because he literally felt that she was right there in the card. She was embodied in the card. So when I saw that Kevin, I was like whoa, I gotta do something. Kevin: You've got to show it. Let’s do the demo. Come on. I know you’ve been holding off here. Kevin: Connecting with your customer. Yes, I love it. Yes. Authentic connection, and yes, instant recognition, and top of mind, and all of that stuff. Kevin: So you created this? Michelle: I created this. This is an app, it’s called REVEALiO. Michelle: And this is something that we all have. It’s like ‘what’s in your wallet’ Kevin? Do you have a business card? Kevin: Want me to hold it? Michelle: I’m going to demonstrate a business card. If you wave your phone in front of it . First of all, have you ever had somebody ask you what it is that you do for a living? Michelle: Yeah! Well rather than try and use your words, why not just say, let me show you. Michelle: Let me show you, you hold your phone in front of it and it comes alive, do you see that? Kevin: Yes. Oh my goodness, you’re talking right on your business card! Michelle: I’m talking on the business card. The video tracks with the physical object. Michelle: And these CTA buttons allow you to actually convert them. Kevin: Look at that, okay Hi Michele. So you’re actually giving the pitch for your business. Michelle: But I’m doing it in a way you haven’t seen before. Kevin: No that’s amazing, I love it. Michelle: What happens a lot of times is that people will just be like; ‘Woah!! What is that?’ And so that drums up conversation, and then you can incentivize them to download the app. Click/tap on the free gift icon. Kevin: Beautiful. So I’ve seen some things that will pop up from certain kinds of apps, but this… tell me how you’re different from what else may be on the market. Michelle: Yes, so yeah, a lot of AR companies. There are quite a few, and they are coming up more often because Tim Cook has proclaimed that AR is a core technology. Everything moving forward, we can expect we’re going to have more interactive virtual content right? Michelle: So what a lot of AR companies are doing are focusing on a very robust, 3D interactive content. And it’s really quite something. If you want to have your mind blown, just Google AR. But what we’re trying to do is keep it super simple. We’re putting the power of creation in your hands, rather than allowing, or making a business owner have to go hire a developer, a 3D creator, somebody to create all that content that they don’t have the means to do. I’m hearing that most business owners like; ‘woah, I can do this? I can do this! I can do this! !’ And they get all excited. Michelle: In a way, it’s a do it yourself, but we also provide more of a full service for those business owners who do not care to do it themselves because they have enough on their plate. So I say, just bring us your video, bring us whatever it is, ict can be a book cover, it can be a banner, a postcard, it can be a business card! Michelle: I can be a wedding invitation, an event invite. So what we’re able to do is let us take care of this for you. So we are more of a full service. BUT there’s more! Kevin:I like that. You’re stealing one of my lines! Michelle: Oh wait, there’s more. What we are now also able to do is provide business owners the opportunity to go into their REVEALiO creation and change out their content as often as they want. Michelle: So that makes their front end piece, whether it be a business card. Kevin: So you set up a kind of framework, and then they can do interchangeable videos. Michelle: Yes, and change their CTA. So yes, you can freshen up your campaign. Everyday if you wanted to. Kevin: So this is a differentiator itself. I love that. And when I think of what obstacles you help business owners overcome, this is a connector to their… it is a relationship builder. Kevin: I mean obviously it worked for the soldier and his girlfriend and now you have an ability to in a very unique fashion, get customers. Michelle: And then he said three days later, that he was sifting through his hundreds of business cards you know you get, and only one stood out to him. And I said to him it was the one that came alive. And he said that is exactly why I’m on the phone with you right now. I need this for myself. Michelle: So we’re getting really awesome reports back from people who are using it as a disrupter. Kevin: Well Michelle, it’s a great story. I’m sitting here, we’re talking. So you are a developer of AR, it’s a mobile app, this is the wave of the future, you mentioned Tim Cook, and Apple, I was going to say Microsoft, that’s their biggest competitor. So all of the big players have to be looking into this. You’re kind of one of the innovators now. So are you getting it rolling? Michelle: Yes. So we recently launched, and we’re ready to get investors and we’re ready to get, we’ve got some sales, but we’re seeing a lot of buzz. The more I speak, the more I do webinars, the more I do radio interviews, the buzz is really starting to generate now because we’re done building and now we just want to take this to the world. Kevin: There’s a ton of entrepreneurs out there right now, just listening to us. And they’re thinking about working with Michelle or seeing this AR kind of business. What would you say to them? Any kinds of words of encouragement for anyone listening right now. Michelle: Yes, if you have something that you know is going to make a difference for somebody, make their life better, make their business grow quickly, and you are just struggling to find a fresh edgy way to just get noticed, and get people to hang on your word, just long enough to be able to demonstrate what you can do for them? Then this is the tool for you. If you are wanting to be a forward thinker, and looked upon as a disrupter in your oversaturated industry, there is no other tool out there like this, REVEALiO is there for you. We’ll take all of the… we will do it for you. We will literally make all of the magic happen. All you have to do is just believe that this is indeed what is going to create the buzz that you’ve been seeking, because it will. We’re already hearing back from people. So encourage you to go to REVEALiO.com to learn more about it. If you wanted to get a free consultation call so we can discuss your project, just write to us at info@revealio.com and we’ll set up that consultation.
" Everyone is doing real estate, everyone's a coach, everyone's an author, everyone is doing this. And there’s people in all of these markets who want to stand out and disrupt something. Michelle gives that. REVEALiO offers that disruption. Brandon: Goodmorning Money 105.5 in the now. Mike: Goodmorning or good evening, depending on when you’re listening to this broadcast. Brandon: How’s your morning going Mike? Brandon: Of course, it starts early and only gets better and better as it goes. I used to think of the morning as my little prime time space. I take some time out every morning to have some - 10 minutes, 15 minutes, an hour, whatever I can, but now I know it grows throughout the day so you nailed that. 100% getting better all day long. Brandon: Yeah, you wake up and everything just goes down hill. I’ve had one of those days before. I choose not to have those days anymore. Now I kind of just stop things. When things are going bad, I kind of… (sigh) what am I grateful for? Mike: You know the key thing to what you were just saying was that you’re in control. A lot of people don’t realize that, you’re in control of you. And your emotions and the things that happen within you. Now, you may not control a situation, for example if someone cuts you off. You’re not in control, but you are in control to how you react to that. And so you’ve got to think about why waste time on something you have no control of? And focus on controlling what you do have. And your emotions are a big part of that. Brandon: We teach that whole piece in Design It. And even our mentorships that maintained and controlled by self. If you can’t maintain and control it, then you have no control of it nor can you change it. So when things are maintained and controlled by you, your mindset, the way you breathe, the way you eat, things that you can do. You can’t eat for someone else. You can’t eat for that driver that cut you off. You can’t make that other driver happy. You can try. But those things are not maintained and controlled by you. Mike: Yeah, and especially today, where a lot of people are not controlling their emotions. And doing the things that they should do in order to control it. It leads to a lot more craziness. So why escalate something? Because anything you do, everything has a ripple effect. Right? So the cause and effect. If you do something, then that effect happens. So you might as well be positive, to make that ripple effect always positive. And not go down a path that you don’t want to go to. Brandon: Yeah, and all of our listeners out there that follow any kind of mentors, or the instagram guys, or the thought leaders are all recognizing and coming out about how your mindset does everything for you. How you produce your brand. How you feel about your brand as a company. How you are getting that brand out there is huge. So those of you who are just joining us this morning, you know that we have the Design a Course coming up on the 20th. And we’re still giving away, I think we have a few tickets left over so, design a course.com. Use the promo code design it 105, but I think the floodgates are open until Saturday, with free tickets right now. So those seats that are left open for you guys, go to designacourse.com because we’re going to be teaching a basic simple foundation which is also going to lead into our guest that’s coming up today. That is when you design your foundation, and then you build it the correct way to have brand awareness, how you’re positioned, how your audio voice, your logo! Everything that you do for your company, we teach you in designit, goes in the fashion of designing it, building it, then sharing it with the public. But once you have those three little keys down, those three secret foundations that we teach in this course, that’s how you’re going to grow even more. And having the mindset to know that you designed it correctly, and you’re able to share that with everyone, makes life so much easier. Brandon: And saved that whole Pokemon era. All of a sudden, my kids weren’t collecting the cards anymore, nothing was going on, and AR took over and opened up this new app and it like blew up. Pokemon was everywhere, All my phones, my tablets, my kids were going crazy. ‘Dad give me your phone, I’m going hunting throughout the mall.’ Like no you’re not. Mike: Yeah well even my conversation with Jeff Hoffman who was one of the founders for Priceline, and I know he’s playing big in this arena, and the AR area, and also the VR. And it’s amazing what this technology is and there’s going to be more applications for business. So when we come back from break, we’ll be able to introduce Michelle, and talk about this AR, and what it does for businesses. But I can tell you like for example like when I was in a conversation with Jeff, you know in Japan, they have these sold out concerts, completely sold out. Every single weekend of this one girl, and she is completely a hologram - made up. Brandon: They’ve done it. They had it on the emmys, they had it on the top golden globe awards. They brought back people, Michael Jackson did a whole one. Mike: The Jetsons, the Jetsons are coming. Pretty soon you’re going to be able to look online. And we saw a presentation from a gentleman who had virtual seminars. And you literally put on your glasses and jump into the seminar and you were interacting and going through portholes, listening to the speaker, and downloading information on it. But this lady Michelle, that we’re going to be bring on after the break, she’s really spun it around to work for us as business owners. The business owners are getting full access to this so when we get back from the break, we’re going to have Michelle Calloway on, on Money 105.5 in the now. Mike: Welcome back. In the now radio with Brandon and Mike. Today I’d like to introduce a dynamic female tech founder who’s opening the doors to an emerging marketing technology that will literally stop people in their tracks. It will get you noticed as a business owner, blow the socks off of your competition, and I’m not going to share too much about it, because she’s going to share how this is happening. Through AR, she’s really taking the business card, and the postcard, and all these beautiful things to a whole other level. So let’s introduce Michelle Calloway. Michelle how are you? Michelle: Hey! I’m doing fantastic! Goodmorning. Mike: Goodmorning. Glad to have you on the show! Michelle: Yes, thank you. Thank you for having me. It’s exciting stuff. Mike: Well you’re doing some revolutionary type stuff and some exciting things and this whole AR which people are going to start learning. Especially from a business standpoint what you’ve been able to do. Why don’t you share with some people first, what is AR? And what does it really mean? And let’s get into like what are you doing, and we’ll introduce what your technology is and what it does. Michelle: Sure, sure. The word augment means to add to, you know, so what we’re doing is adding to our reality. So some people have heard of virtual reality, when you are putting on those goggle, essentially taking yourself out of your real world and entering a virtual world completely immersive. It’s fun! There’s all these phenomenal things, I just gotta tell you, I’m amazed, I’m blown away every day on how even virtual reality is really enhancing human connection which is what I’m all about. I love using technology to enhance our connection to one another. And that’s why I got a job in AR to begin with in the first place. What AR does is that it blends the two realms together; virtual and real world, allowing us to see virtual content without being taken out of our real world environment. Which is phenomenal. You mentioned Pokemon Go a little bit ago and that is exactly what put AR on the map finally because we’ve been around for a while. But that game right there really got people noticing and hearing about AR. So now what we’re trying to do as an industry, is find new innovative ways to make it very useful, besides gamification. And that’s where I come in, with the claim of bringing it to the business owner as a tool to completely disrupt people where they’re at. To get them to stop, and shake their head a little bit and go woah, how is that happening? Brandon: Yeah it is, when you sent me the sample, the first thing I did was download it and watched it three times. I was like ‘oh my gosh, she has really brought this to life.’ So your company is called REVEALiO right? Michelle: Which means to reveal something magically, yes. It’s a fun word that means something. Brandon: Yeah! It’s a fun word, it means something, it reveals something. So the main website our listeners can look at is revealio.com? Michelle: Yes, so it’s the word ‘reveal’ - ‘i’ - ‘o’ - .com. Brandon: So R-E-V-E-A-L-i-O-.com. REVEALiO. So tell me about it. I mean, if you’re looking for a fresh edgy new way to make impact and influence and ultimately make more income as a business owner, how’s REVEALiO going to help? Michelle: Well we all know that video marketing is one of the top things you can do when it comes to digital online marketing. Because what it does, is that it allows people to quickly and visually understand who you are and what you are doing. What purpose you serve. What value you bring to the table. And everybody is finally jumping on that bandwagon. I mean it’s been a while, but 2018, everybody is doing it. If you’re not, yeah, people won’t even read anymore. It’s going straight to just watching videos. That’s what’s spreading. That’s what’s going viral. That’s what’s getting the messages out. So what I’ve done is created an AR tool that you can have in your arsenal, on the ready, so that when you’re out and about in the real world, you can have just as much impact. And what that means is that some things as simple as a business card. Because first of all, AR is image based recognition by nature. There are also other ways you can trigger the response. But what we’re doing is using images like a business card, or a banner at a trade show, or flip card. Anything that you’re going to use to hand to somebody to market yourself to get them to remember you or to contact you, we can add another level of communication now, and giving them an experience that is so robust, interactive and shocking, that you are sure to be top of mind. On top of that, there are CTA buttons that appear. When you wave a phone in front of a business card let’s say, a video will actually start playing on top of the business card. So it’s not just a standard video player like YouTube. The video actually lays on top of the shape of the business card and tracks with it. So as the business card is being moved in one hand, you see it moving with the card. It’s quite dynamic, unlike anything that anyone has ever seen before. Mike: It’s powerful and I wanted to touch on this real quick. But it is a… When you first see it, you’re like ‘woah! Trippy.’ And I’ve even seen people take the card and turn it over, and they’re like, ‘where’s the video?’ And they put it back in there and so on. So it plays through this app you have. But you have made a strong point that it is so impactful that you’re at top of mind, well I know people who will take that to 10 or 20 other people to go show it. And that’s powerful! The viral of showing, hey check this out. Because when I first saw it, when I met you, right? And we talked for my books and things of that nature but this can work on business cards, books, banners, all this. I showed, I must have showed at least 15 people the power of this. Brandon: Absolutely. I think I watched it myself three times. Michelle: I think there’s a big reason why it’s so captivating and a reason why video itself is so powerful, is because in analyzing it, video, it taps into three of the four dominant learning styles. You’ve got the visual, you’ve got the audio, you know you’re able to hear it. You’ve also got the reading, people need to read it in order to learn. So if text pops up on the screen of your video, you’re able to tap into all three of those at once. Well what AR does is completes the circle and adds that fourth element of that tangible, physical, artifact, that now comes alive with that extra added value. So that is one of the big reasons besides that it is so new, so fresh and different. And it really resonates with the largest majority of people. They walk away completely amazed. I had a guy tell me who went to a medical conference in Florida, and there was a guy there that had a business card that came alive. He didn’t wait to go show it to everybody else. He literally yelled at the top of his lungs to have his colleagues come over in this really busy convention, and watch it right there. So he was causing a scene trying to get people to come over and look at this. And everybody just started huddling. It was like bees and honey. Where people just swarm around you to see what is the big fuss because people respond pretty amazingly when they see it so it’s definitely an impactful tol right now. Tim Cooke CEO of Apple is proclaiming that this is now a core technology. AR is core technology. Meaning that everything moving forward is going to be having an interactive element to it. So we need to expect it. So what I’m trying to do is offer this opportunity for business owners to tap their toe in the water now so that they don’t just completely drowned out by the tsunami wave that is upon us with this tech. So Tim Cooke has been saying that this is going to be as influential for our society as the smartphone. So that’s big, huge. Mike: Yeah, and I think that with your, our audience needs to understand is the power of what this does. You talk about the video right, and these modalities of learning. But video is the future period. Comcast, all these companies are moving to online videos, everything is video. Video, even if the masses was to know about this, it’s still going to be intriguing enough to know what the video says. So people will pay attention. So you could be in a trade show and they scan your banner and it comes alive. Or you could probably, you’ve seen those cardboard cutouts of celebrities right? You could probably augment that and have them talk to you and have them say testimonials. I mean the way technology is going to be us and I know for me, I’m going to be using it for my books. But even if a banner outside of an event, ‘hey scan here to learn the secret code for today or whatever’ and I know you did an event where you spoke on stage and you had a little content. Why don’t you share with folks what that was? And how you used it from the stage? Michelle: Well everybody says, you know, you have to download an app. And this is just one of the first things that people ask about. And the reality is in order for AR to work, it has to be viewed through a lense. An AR lense. Not everybody is wearing those glasses that are coming out that are going to free up the hands, but in the meantime we’re going to stay relevant and give people the opportunity to use their smartphone. So what I encourage business owners to do is to incentivize their audience, for anybody that you come into contact with, to download the app by giving them something for free by doing so. I played it as a treasure hunt game. I had multiple different images on different cards that were getting passed out to my audience, and one image was going to trigger a grand prize. And so I had everyone in the audience download the app at the time I gave them the notice. Once the game was being played, you know it was fun! There was a lot of buzz going on in the room. And 70% of the room ended up converting into my 2-step verification mailing list. So that was powerful. So what I basically did made sure that everybody was a winner. There was a grand prize and then a compilation prize winner. But ultimately, 70% of the room converted. I suggest that everyone turn their business card into a gift card. Everybody has something of value that they can give away for free, it doesn’t necessarily have to be a monetary thing. It could be the 5 steps to unlocking whatever it is that your industry is that people are craving knowledge about, you could share that as a free gift. Incentivize them. Mike: It becomes your magnet that goes into your sales funnel, right? If you had a postcard that you handed as you meet people and say, take this, scan it, it’s a great message, and then it leads into the funnel where they register to get something for free. Right? Brandon: She had the two step process right there at the conference. They went right into your mailing list. Brandon: Yeah I remember after our meeting that night I had a lot of ideas going through my head. So the video pops right up, plays on top of the card though the app. It’s just a brilliant technology. All of you know who have been listening to this show, we talk about the digital world and how you need to embrace it. This is core tech. It is going to be enhancing human connection through your business card. How many times do you have a business card that just goes into a stack? I’ve literally been at my desk, and seen your card again and watched the video just because I knew the card came alive. Brandon: You could send out a newsletter out every month saying to check out the updated video. Michelle: Yeah, we just actually rolled out that model at the end of February and I’m thrilled because I’m able to give business owners more power now, to be able to update their video if they want. Like once a week. Keeping their digital content very relevant. Maybe they want to do a campaign. And alter their CTA buttons as well. Plus they get a little visibility on how often their business cards are being viewed. So they can tell volume wise how often someone is scanning their card. There’s a lot more power now. Mike: What I love about that right…I think about... Well I’ve been doing business since I was 16. I spoke all over the world practically right? No, it was just like last year. Anyways, I’ve spoken to millions of people and I’ve handed out business cards, and postcards over the years. If you could imagine how many people and you could everytime change a different message. You got a new book that you’re launching, right? So people that have that, you encourage people, hey, every month I have something new or whatever. It gets the message to the 70 million or the million people that I would talk to, and get them into my database, eventually get them into the database; because that’s the ultimate goal, get them through the sales funnel. But ongoing, that’s a pretty powerful thing because I have spent tons of money on postcards and business cards out there that are just sitting there, and who knows, they may have been thrown away. But if they know that they’re interactive and always changing, they’re going to hold on to your card, and they’re going to meet somebody that needs your service, or they’re going to know somebody, and say you need to check this out. Not only are they cutting edge, but here, here’s what they do. Right? And then you have some special that month that you run for that video or that particular that they scan the card. It’s powerful, powerful! Michelle: Yeah, in real estate, people are excited because they can have their real estate card show the top house that they’re trying to sell that week and then if that house sells, they can set another one on there. Virtual tour and CTA buttons to actually get a hold of the agent. There’s a schedule now button, a buy now button, a gift button. There’s lots of different button options that you can have on your REVEALiO. Brandon: Welcome back. John said we’re coming back and then I’m thinking that the guy who was in here earlier doing the Sound of Music, and what was the other show? Brandon: Way before our time but I had that song from Welcome Back Carter come back into my head. Welcome Back… that old show with the dude with the big afro and the mustache. Mike: He was bringing up classics. Classics? Classics in the 90’s was the classics for me. Brandon: The classics were in the 90’s. So today we have special guest Michelle Calloway from REVEALiO. She has found a way to enhance human connection. Business cards, postcards, books, whatever you have. Whatever material that you’re handing out to your audience, your perfect clients, let them experience the AR of seeing you through these little handouts. Mike: Yeah you could have, imagine on the table top, like you’re doing any type of local fair or where ever. And as people come up, they can get a special code to get something discounted, but they scan the table, the image on the table, right? Because that’s all she needs, is the design, of it. But you know, Michelle, welcome back by the way and as you were going into some of the technology, you know, when we met, we talked about books. And I fell in love with the technology because of how I could use it as an author. So not only… I can promote the book of what they’re in. So imagine the book that’s sitting at the bookstore. ‘Hey scan this to learn more about this book.’ Even, EVEN if they don’t buy the book, I can get them into the sales funnel. But I deliver a message that entices them to want to get the book, and then give them some kind of special bonus for doing so. And I just, for me as an author, and the books that we do, I think it’s just a powerful message to be able to get to your audience. A personalized message that comes to them through this vehicle. But you’re right, it’s not just for the book, it could be a banner. Brandon: Anything that you have in front of a person, can be scanned, if you’re handing out a flyer, if you have a restaurant, and you have a new special that you’re promoting like taco tuesdays, and you hand out a taco tuesdays coupon, they can literally go there, hit the bar, like remember the old bar code where they scan it and it gave the phone number, name and address? Brandon: The QR code! It was huge for a long time and of course, people are still using it! This is the new way to enhance the human connection. This is a better way to give a piece of yourself because remember, people buy people. Brandon: Just shampoo, you could have a full video of me washing my hair. Like ‘hey, look at how great my hair looks!’ But for those of you who are just joining us now, we have Michelle Calloway on and she is the CEO of REVEALiO. REVEALiO.com, that R-E-V-E-A-L-i-O-.com. REVEALiO. And she has literally enhanced the human connection through this core technology that even Apple is saying is going to be core tech with all of our smartphones going forward. Mike: Yeah, it’s going to be probably installed into the phones. And even think about Google Glasses, you had those Google glasses at the time. Technology is going to evolve. Brandon: My very first experience was the Stella Artois app. So Stella sent out this email that said ‘thanks for joining our little membership. Take your phone and hold it up into the air after downloading the app.’ And it showed you every single restaurant that was serving their beer down the road that you were pointing at. And I thought, ‘Oh my gosh, they just revolutionized the people that drink this beer.’ And when I saw yours I was like; ‘you’re going to be a millionaire. You’re going to be a billionaire. Your company is going to grow so big because the use of what’s happening here… There’s so much breath to it. It could actually grow in so many ways. Mike: So what are some of the challenges? Brandon: Yeah, what are some of the challenges that you help businesses overcome, when introducing this technology to them? Michelle: Well one of the number of problems that I am hearing from others in the first place is that they are not finding fresh edgy ways to stand out from the sea of digital noise, yeah? So, there’s so much competition out there that we’re all pretty much dealing in an oversaturated market. We’re able to disrupt people’s mindset. When you’re out and about, in the physical realm. To be able to stop somebody in their tracks and get them to only just focus on you because they just blew their minds, is a very powerful thing. So that’s kind of our focus as far as we can help business owners, is to provide an experience that is so captivating, so mind blowing, that you literally have people like just jaw dropping and paying, and hanging on your every word. So that is the number 1 problem I’m hearing from business owners. And I mentioned to you earlier about that AR has to be viewed through a lense. The interaction only takes place when it’s being viewed through our AR app at this point. Not everybody has AR glasses yet - those are coming! But in order for them to witness it, they have to have an app. So the business owner themselves, needs to have the app on the ready when you’re out and about networking. Have you ever been to a networking event guys where somebody says ‘hi, I’m so&so’ and then, you ask them what they do, and then after they do that, they explain, they look at you and ask you ‘what is it you do?’ Well how powerful would it be for you to say, ‘well, let me show you!’ I mean, nobody wants to really spend hours explaining the value that they are able to bring if they can show it in a matter of 60 seconds or less. Brandon: Yeah, especially when you have your audio logo down. So you’re like I typically work with these people to help with these problems and this is how I solve it. If you had that recorded, to where you could actually give that message flawlessly every single time, by just showing them, bit even the best step; you show it to them, and it comes alive! It’s alive right there in front of us! Mike: I was just going to say, the technology is just going to get better. So I’m thinking of five years from now, or ten years from now, you’re not going to be worrying about the app. Right now you do and that’s okay because it’s new, it’s innovative. Well remember the first cell phone? That thing was a brick. It was heavy. You don’t remember that? I found one in your garage, what are you talking about? Dude, I found your old pink pager, what are you talking about? So over time, the phones are smarter than what it took us to get to the moon. Right? The technology. So this technology is just amazing and it’s going to grow. And you’re on the early stages of this, and this is why I love about what you’re doing. How do you see the next five years? Michelle: Well what I see in the next five years being in terms of AR, is right now that all of the AR programming has to be done in individual apps. That’s where all of the software - I’m sorry - the content is being connected to, you know. We don’t have just one network right now where all AR content can be displayed through. We’re not there yet. The technology is changing very quickly, and we’re all watching and seeing, and following suit as quickly as possible so that we always stay relevant. So right now, where I see us, from where we are today, to where we are in five years, I see that everybody is going to have, probably some sort of smart lense in their glasses or something. So that wherever they go, it’s kind of like Ironman, just think Ironman. That’s exactly where we’re going. It’s basically going to be these HUDs in our glasses that are going to give us indications that there’s content to be viewed if we so choose. Now think about that. We have to still make sure that the human has control. That we don’t want to bombard them with too much content all at once. We want to make sure that it’s presented to them as they need it. I’m not sure if you guys have heard about what SmartGlass is developing right now. I know Mike mentioned that (Jeff Hoffman) was talking about how SmartGlass, you know, you just breeze by it. And it’s a text to your smartphone and it automatically will pop up this little window saying; ‘would you like to take a look at this dress?’ It’s tech that when you’re recently looking at something along those likes. I mean it’s incredible, where SmartGlass is going and SmartGlass, combining with AR, combining with AI, holy cow we are just going to have everything at our fingertips. Of course building robotics, of course we’re heading down this path where we use to always think it was just sci-fi. It’s becoming our reality. Brandon: Absolutely, so everybody out there right now, we have Michelle here in studio, she’s CEO of REVEALiO. You can go to REVEALiO.com. But really what I love, and what you’re doing is just amazing. Enhancing human connection for us out there who are in an oversaturated market. Everyone is doing real estate, everyone's a coach, everyone's an author, everyone is doing this. And there’s people in all of these markets we want to stand out and disrupt something. Michelle gives that. REVEALiO offers that disruption. If I was a real estate agent, I would have this on every card I did, every flyer I passed out. If you drove up to the house and pulled out the little showcase to see the house. And on there is only two bedrooms, I only had enough room for three pictures! Oh look, I can do a tour of the whole tour right here! Better than the virtual tours. And then life insurance, me as a coach, Mike as a speaker, a coach, an author; this tool works for everybody! So Michelle, you have knocked it out. This core tech that you’re in front of, amazing! Michelle: My focus has always been to make it affordable, and attainable for small business owners. I see that a lot of them struggle with technology and how fast it’s moving and so the reason I built REVEALiO the way I built it was to make it super simple. That’s why we focus mostly on 2D video overlay. Because everybody can create their own content more or less. You know? AR can be far more than even what REVEALiO is doing. In fact, I challenge everybody. If you really want to blow your mind, Google AR and find out what is happening in the realm. It is over the top amazing. It’s so inspiring. I mean I just get so excited everyday. Really. So excited everyday about the new stuff that is coming out. I try to keep it simple. Mike: Yeah, on your website, you actually show how the business card with the phone over it and how the video plays within there. So I mean, for them to go and check out your site, so again it’s REVEALiO, R-E-V-E--L-i-O-.com. Mike: Did I miss the A? Mike: Man, especially after she talked about me as Ironman. That was so nice of her. Brandon: Michelle, we’re going to go to a break but when we get back, we’d like you to get everyone to know how to get a hold of you other than the site. So anything that’s going on, promotions, you can bring it up, on Money 105.5 in the now. Brandon: Now we say the number 1 show for entrepreneurs, but today we’re actually really going to push this on you. We are the number 1 show bring you the best tech ever! Mike: It’s the funnest tech too right? It’s the funnest, so powerful for entrepreneurs. I love it. We’ve been talking to Michelle Calloway of REVEALiO and talking about AR and how in your marketing and your business, you can use this technology with her product and services. So it’s been a powerful conversation. What do you think is the one question that we haven’t asked that we should have? Michelle: Are you asking me? Brandon: Oh yeah, that’s our big stumper for you. Mike: That’s the big one. Michelle: Okay, the one question you have not asked that you should have. Do you have to be tech savvy in order for this to work for you? And that is a good question. And the answer is absolutely not. I have 90 year old authors out there demonstrating the power of the book that they have written. And gaining more and more influence by showing people that not only did they write a book, but now that book cover comes alive with a personal video of what that boo is about. So that’s pretty awesome. I really have strived to make it super simple. And you do not have to be a designer, a developer, or anything like that in order for this to just really work for you. To create more impact, influence, and ultimately, more income through the opportunity of disrupting people where they’re at and getting people to hang on your every word. So that is exactly the… you do not need to be tech savvy. And I also think that people need to understand that when it comes to creating AR campaigns, normally, if you’re looking to deal with something quite large with 3D content, interactive content, you are probably looking at something around $30K or more. The expense of AR from REVEALiO is under $1000 to get started. Actually, I have been running an early bird special and I wanted to offer it to your audience today, if they did want to take advantage of that. I’m giving you $500 off your one time setup fee. If you go to revealio.com/special, I hope you guys put that in the chat box, go to the word special after the forward slash. You will see that you can get $500 off your one time setup fee. And again, my goal is to make this attainable and affordable. So even at $500 off, it’s still something that you’re not ready for, we can do payment plans. We really are striving to meet you where you’re at. What we get with that is that we provide you with 12 months of activation on the image that you provide for us. That could be a business card, a book cover, a banner, or a poster. And also, we give you one hour of our design time. So I have people say that ‘I don’t really like my business card and I would like to make it snazzier for this new REVEALiO. Can you help me?’ Yes, we help you. If you need help with video, we can also assist. We have different services available. If you don’t even know what you should be saying on camera, and you need somebody to coach you to help you figure out who your perfect client is, what you should be saying to that perfect client through the video, we have a package for that as well. So just get going, get started, and let us help you, let us meet you where you’re at. And you’ll also get 30 days of free trials that have membership back end access that I talked about earlier where you can go in a change out your video everyday if you want to, change your CTA buttons so that you keep your content relevant when it comes to the digital side of things. So that is revealio.com/special. And you also get a free 30 minute consultation with that as well. I hope you take advantage because, the feedback we’re getting back is just amazing. People are calling people back months later saying ‘I remember you, I want to talk to you more about what you do because I was so blown away when you showed me your business card and it came alive.’ So that’s what we’re all seeking right? More influence? Brandon: Exactly. More influence, disruption, and enhancing the human connection. Michelle Calloway from REVEALiO everyone. Thank you so much for being on the show today Michelle. Michelle: Oh, thanks for having me guys! Mike: Oh, it’s been great yeah. Looking forward to many conversations with you. Brandon: Alright, well thank you for being a part of the show and we’re going to go on to our next segment. You’re welcome to hang out if you’d like. Mike: Let’s give a shout out to some folks that are on the live stream on facebook and Kevin Allen is on there, we have Nichole Heinz, we have Danny Hockenberger, Gabby Igularis which is my baby, my finance. And Ed’s on there. He’s living large. And amazing Michelle Marie, she’s on there… We got some folks on there that are sharing their time. Brandon: Those of you that are on there should be looking into this. This thing that she has, it’s like she said, you know. Getting your audio logo out there. These are all the core pieces that we push and design it. Teaching you these barebone things to get your business thriving and enhance that human experience. REVEALiO just launches that to the next level. Mike: It’s going to be a powerful way to market. Brandon: It is a powerful way right now. If I was in this market and I knew there was a lot of competition, I would definitely disrupt it by using this product. But you’ve got to have that foundation. So for those of you that have not gone to designitcourse.com to get your free ticket, now is the time. Not this week but weekend after, three days live with us where we will teach you the basic foundations. The real three tricks that every business is using to grow. Now that growth isn’t just growing revenue. That’s growing your life too. The more systems you have in place. The more tech that you can adapt so that you can do what you do best and delegate the rest off to these things like REVEALiO; that’s how your business is going to grow. So designing your business to gain your life. Designitcourse.com The doors are open I think there are 10 free tickets left. You just click through there, hit the free promo, get the free ticket, register you and a guest, and we’ll see you out there. Brandon: Michael, what were your takeaways from today’s show? Mike: You know, the biggest thing that I’m excited about this technology is that it’s already powerful like you said right now. And so when you think back to the phone, it was kind of cool. We were use to having phones but now it’s a brick and I can carry it wherever I go and the technology has evolved. And so we’re like ‘that’s cool.’ And now, this is impactful now, imagine where it’s going to be five years from now. Right? And how this is going to work with your marketing. So folks that are thinking of ways to differentiate yourselves, start participating now because it’s just going to speed up. So that was the big one for me; was that the early stage for me is powerful for us right now. How about you? Brandon: Mine was enhancing the human connection. What I love about what she is doing is that it’s bringing you to life. I could have a cool card right? I could be doing jumping jacks, have a cart wheel on there, wearing a jazzy shirt, have all of my brand foundation presenting on my business card. But it still isn’t coming to life and it’s probably too busy. So being able to enhance that human connection; that’s what we teach in DesignIt is like; talk to your audience. Who are they? What’s your perfect client? Get in front of them with your WHY. What if your card scanned says I’m here to help. And they say that video and really looked at you and said, this person is sincere. Enhancing the human connection was the biggest piece for me. It always has been. My mindset about businesses… I challenge everyone on this radio channel. To all of you on social media, if your customer is an alien, okay, I’ll give you a free ticket to DesignIt. Your customers are human! Everyone you serve is human! You opened your business to provide a service to another human. So enhancing that human connection. That’s where it’s at. That’s where this got me. That’s when the business card hit me the best. We went to dinner with these folks and talked with them all night and oh my gosh, this is revolutionary, they have a great product. That’s why she’s on the show today, to share that with you. Mike: Yeah, from here on out, just thinking from the creative side of what people are going to do with some of the videos. How they augmented… giving something through the video that’s actually on the card, that looks like it’s moving or whatever. Like what you said, putting up the phone and seeing down all the restaurants and all of the beers that they serve. Brandon: Or a dog walking service just showing how nicely they walk the dogs down the road. Just a nice little video. It could be used for any business. But those of you who haven’t got it yet, go to revealio.com. And those of you that are really struggling with your market right now. You’re stuck with something. You’re not getting past what you need. Come see us the week of the 20th. At DesignItCourse.com. Get your free tickets and come out and see us. Let’s jump in, deep dive into the struggles that you’re having. Let’s really hit this stuff home for you. Mike: How about this customer service? Or how about something that you mail out saying thank you for the purchase or whatever? Or even support. It gives you videos. You put that desk together from IKEA and you’re like oh my gosh, what am I doing wrong? You scan this thing and then there’s a video here; do this, this and this. You know, where this is going, and the ability; you don’t have to search online, you know it’s all in the customer service delivery as well. Brandon: Like Michelle said at the end, if you’re having trouble with your audio logo, if you’re not sure which client your aiming this at, that’s why we have the DesignIt course. DesignItCourse.com. Come learn the basic foundations to get your business to that next level. And when I say basic foundations, these are things that you have probably overlooked because you have been working in your business for so long. That you haven’t had a chance to stop, and work on your business. Three days of fun! Mike: They get to kick it with us. Brandon: Yeah and you know we love to give value. All of our customers, we give out the value. Thank you being with us. Money 105.5 In the Now. Mike: And we’re here every Thursday at 10am. In the Now with Mike Driggers and Brandon Hintz. So we’ll see you next week. Bye for now. "That’s just incredible... it's just one of those things that you have to see the power of. It's almost like going viral in person. ​J: Hello and welcome to Marketing that Won’t Break the Bank. 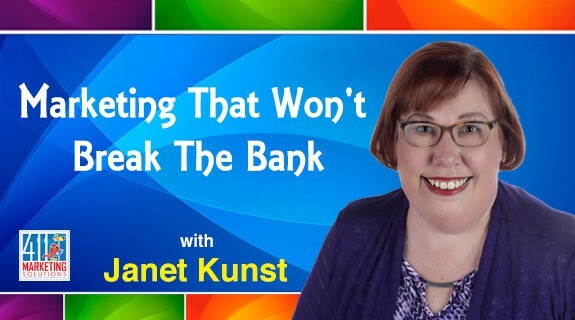 I'm Janet Kunst, your host and I’m so glad that you’re joining us today. Because we have a special episode in store for you. And we’re going to be talking about how to disrupt your marketing with augmented reality. So before we get started though, I really want to give you a definition of what exactly augmented reality is. And the definition is, the dictionary defines it as an enhanced version of reality, created by the use of technology, to overlay digital information on an image on something being viewed through a device. Which is a smartphone camera. And unlike virtual reality which kind of creates a total artificial environment, augmented reality uses the existing environment and overlays information on top of it. So it’s using an app, looking at your phone or whatever device you’re using, and seeing an enhancement to what image you are viewing, or the landscape you are viewing, or if you’re in a store, the item that you’re viewing, that sort of stuff. And it’s really taking a video marketing to the next level, and giving you the opportunity to give your audience a new way to connect with you. And since this is such a new and evolving idea, especially as it relates to marketing, I thought I’d bring on an expert whose company is already providing augmented reality marketing services to businesses. I’d like to introduce you to a dynamic female tech founder, who has been recently featured in Inc. Magazine, and she’s opening the door to disruptive marketing techniques and technology that will literally stop people in their tracks, get you noticed, and blow the socks off of your competition. She’s going to share with you how she can take a potential lead through the entire buyer’s journey in less than 60 seconds, while creating a memorable experience that gets people buzzing. So if you’re looking for a fresh, edgy new way to have more impact, influence, and ultimately more income, please help me welcome international best selling author, founder and CEO of REVEALiO, an augmented reality video marketing tool, Michelle Calloway. Michelle, thank you for joining us today. M: Thank you Janet, that was an awesome introduction. Thank you very, very much. I’m excited to be here. J: I’m so excited to have you on and we have been talking over the last couple of weeks and I could not wait for today. So before we get started Michelle, how about you give us just a little more of your background, and kind of how you got to this point? M: Sure. My background is actually in visual communications and digital media. And I owned my own design agency, full service design agency for a couple of years, and then augmented reality was introduced to me. And when it was introduced to me, it flipped my life upside down and I could not sleep for two whole weeks. I was amazed at the potential that this technology introduced to my mind, and if you were to put me under a CAT scan, there would have been so many colors on my brain, no sleep for two weeks Janet. I hit it hard, was so strung out, but I was elated. I was so like woke up, I could not believe what I could potentially do with this technology. I knew when something grabs you that hard, it’s a calling. So I took it as my calling, my purpose. I didn’t fully understand still what I was to do with it. So I decided that I better learn everything I can about it. So I ended up learning how to become a mobile app developer with mobile augmented reality, I built my first prototype, I started different use case scenarios, started seeing what the market might invite in as far as business consumers using it. And then one day a girl friend of mine, a young girl, she’s 19 years old, came into my office, and she knew that I have found the technology that could make images and objects around us come alive with virtual content in the case of video overlay. In the case of video overlay, video being overlaid on top of a physical object, she said, ‘could you help me with something kind of personal? My boyfriend is deployed overseas in the military and I miss him so incredibly much. I would love to send him a greeting card that when he held the app over the greeting card, he could see me come alive on that card anytime he wanted. And that sent chills up and down my spine. So I knew that was the beautifullest scenario. We went ahead and worked together, she shot a selfie video, on her selfie phone, selfie style on her mobile phone, sent me the video, and I created all of the graphics, and made the magic happen streaming it through my app. He said when he received the card, he was very touched of course, because he had a beautiful faces on it, that she took the time to create the card like that and send it to him but when he waved the phone in front of the card, and she started talking to him right on the card, he said it rocked him to his core. So much so that she felt embodied within the card. That he felt that she was there with him. When I heard him talk about the shrinking of the distance and how he felt so much closer to her, he carried that card with him every day in his wallet while serving overseas. When I saw that kind of impact, on that human relationship, I saw augmented reality now as a portal that can enhance human connection. Like enhance human relationships, even across oceans. I was like wow, now I think I understand maybe why I’m being called to do this, because I lost my husband tragically, the love of my life, and I knew how valuable relationships are. So if I could build an app that would impact people, and business owners to be able to connect with others in such a robust wonderfully, emotionally packed way through this augmented reality portal, then that is going to make a difference in people’s relationships. So that’s what led me to build REVEALiO and what has led me to meeting people like you and being able to show the world that this is available for people to use as a business tool, and as a personal tool, but more or less, I’m marketing it as a business tool because business owners do indeed need to find ways to wake people up a little bit when they meet them for the first time, and be able to in a very short period of time, make that connection that is so impactful and influential, that people will understand why they should work with you. J: That is such an amazing story Michelle. And I think that what we need to do is, well, even for me, sometimes, when we hear augmented reality, and virtual reality, and all that sort of stuff, I think we get confused. So maybe let’s step back a little bit and talk about exactly what augmented reality is, how it’s currently being used, and then let’s talk about how what you’re doing is enhancing that even more. I think that we all kind of know what augmented reality is but let’s talk about specifics here. How would you go about describing augmented reality? M: Well, it is a technology in like how my REVEALiO app uses image based recognition, and so I train my software to look for an image that I programmed it to recognize, and when it recognizes that image, through the lens of the camera, virtual content will appear on the mobile screen, but it overlays and tracks with the actual physical object. So if I’m using something like a business card to visually demonstrate who I am and what I can do for somebody, relatively quickly, I will wave my REVEALiO app in front of my business card, and the screen indicates and that it detects the image, and low and behold, a video will appear. The video is playing on my mobile screen but it is actually moving as I move my actual business card, the video moves with it. So it tracks with the objects and the image. So Pokemon Go is the one that introduced AR to the world and allowed us to use something like the GPS coordinates to project a virtual element through the mobile screen when you’re standing at the right location - objects would appear. Like the little Pokemon character that you’re trying to catch. So that is AR where virtual content is triggered based upon either a physical object or image, like my app uses, or a geographical location through GPs coordinates. And then there’s usually other buttons that appear on the mobile screen that allow you, the viewer, to take additional steps, like in my realm of marketing with this tool, it’s just not enough to have the wow factor where the video starts to play on top of your physical image or object, such as your business card, but it’s also very important to allow the viewer to take instant next steps. So once they have completely the wow factor, the captivation factor, then the influence starts to happen with the visual message that they’re witnessing, they can tap on one of the mobile buttons on the REVEALiO screen to be taken to that landing page where you have them opt in for your free claim or free gift. Or you can take them straight to a buy now page or straight to buy the tickets to the event to the event that you’re promoting. So there’s a lot of power, and through the AR experience that happens through the mobile screen. Eventually we will have AR glasses that are affordable and everyone will be wearing them in our future. So that we can see virtual content all around us at any time that we want. J: Yeah, that helps tremendously. Not only are we talking about just giving information through the AR app, or REVEALiO app, or whatever platform it is, but also talking about the fact that we’re getting user interaction, so they can actually do something with it rather than just take in information. Correct? M: Yes, yeah! And it’s a real time information which is really powerful so it’s not outdated information. So like there are glasses now that apps out there that you can put on glasses and if you have this biking app, and you’re, well you need your hands on the handle bars, you can’t be messing with a cell phone but its like a HUD like in the Ironman movie, so for those Ironman fans. You know, when he’s inside of his suit. There are these mobile apps out there now that allow AR glasses to feed you data - like the grade of the terrain that you’re on. Have you ever been on a mountain bike trail, and you don’t know that all of a sudden you’ll have to take a super sharp turn and you’d have to be prepared ahead of time for that. You can have that kind of data in your HUD in these AR glasses as you’re on your bike actually peddling down a ravine that’s pretty spectacular what they’re able to do. Tesla can detect how fast you’re going, what your pulse rate is, lot of different things. It’s very incredible what AR can do. I always tell people if you want your mind blown, just Google AR and see what is happening. And for a while, it has just been a matter of a lot of wow factor but now we’re starting to break it down and kind of figure out useful cases for it. Like with REVEALiO, we found a useful way to use it as a marketing tool. More or less a lead generation tool as it allows business owners the ability to just disrupts somebody’s thinking when they are out and about networking in real life. It’s not just an online tool, its the bridging of the online with the real world. That’s the beauty of it. J: And that is so great and a great place to have our first break. So when we come back, let’s start talking about how people can use this for lead generation for their business. So stay tuned. J: Welcome back to Marketing That Won’t Break the Bank. 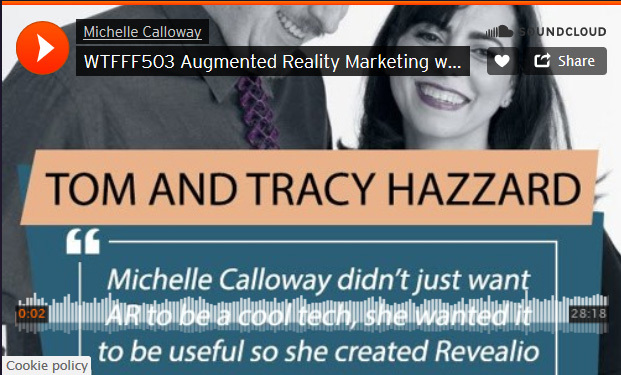 So before the break, Michelle Calloway who is the CEO and Founder of REVEALiO, and I were talking about how AR is starting to disrupt marketing. And Michelle, I just wanted to… You talked about how this is starting to pervade into society itself and it’s no longer a concept that just out there for the few but it’s starting to come down to the masses. So how does a small business go about implementing this into their own marketing strategies? How does this help the small business owner? M: My heart and passion lies with the small business owner. I am a small business owner. When I owned my own graphic and design agency, my passion and purpose was about helping them stand out and connect with their potential customers. Now how a small business owner can utilize something as simple as REVEALiO, I really have made it so simple to work with. Let’s just think for a second, let’s just stop and think how more or less, all businesses are moving towards realizing that they need to start doing video marketing and their marketing campaign. Video marketing works on so many levels and resonates with people very well. You’re able to make that instant connection because they’re able to see you, hear you, and then decide for themselves that you are trustworthy, that they are going to like working with you, that all helps in making their buying decision. Of course you’re able to visually demonstrate your product or service as well. They get to meet you through a talking head. So let’s take that same power that video marketing offers and let’s take it off line. That’s what small business owners can utilize that REVEALiO or AR to do - is to provide them with more power, more impact, more punch - When they are out and about in the real world meeting people at trade shows, at networking events, or just going out to dinner with somebody that you don’t know. It gives them the ability to be able to instead of use all their words, have them say, ‘well here’s what I do,’ and have them demonstrate their business card, like I explained earlier, coming alive, with video overlay on top of the business card. It’s quite magical when it happens, and if you want to see this in action, just check out revealio.com because it’s really hard to describe over the radio, but it’s quite dynamic when an image like a business card comes alive with video content. Then, while you have them all captivated with this wow factor, seeing something that they have never seen before, your video that plays that quick little intro video that you created that hopefully talks about who you are, the value you offer and some quick calls to action to get them to take that next step, that’s playing while they are all captivated by the experience, and that’s when the influence comes in. I’ve seen so many people go from wow, to oh! I want that! Or I want to work with you, oh wow!. You’re the one, you’re the one I’m looking for. And then those CTA buttons that appear on the mobile phone will appear on the screen, where they can go for the close. You can have them opt into something, you can get them to schedule that one-on-one with you like a follow-up. There’s so much power with those CTA buttons that appear on the mobile screen, as well that all a part of the AR experience. So all business owners can use this as a disruptive way to get them to make connections and to have more impact and more influence, and to get people to actually start working with them. And to generate that top of mind buzz factor we’re all seeking. Right Janet? I mean, don’t you want to be thought of months later? Maybe the timing isn’t perfect right? For that potential client potential client to start working with you at that moment. Boy oh boy I’ve had people tell me that 8 months later that they still have my card, that they never threw it away because they keep checking it every now and then to see if I’ve put a new video on there. They’re so fascinated by the whole thing. So business owners can use it as that, a disruptive way to get them noticed. To get them to stop be looked upon as just another, just like their competitors, you know? J: Well, you know I think Michelle that it’s really important because there are so many people out there, so many messages that everybody is hearing today that is… Small business owners need to find a way to stand out above the crowd, and stand out. And one of the things that a lot of the people need to work on is how to get found on the internet. Which means that we’ve spent a lot of time tying ourselves to the internet and to computers and all that sort of stuff, but this is a way… And I love the way that you said this is how you do it offline, so to speak, this is how in person, you take a video that you’ve already done and show it to anybody on the go without having to have, not necessarily having to have a strong internet connection, or having a big screen, but just from your card. And every time they see that card, they can go in, and look at the video, and be reminded of who you are. So they don’t have to go and find your website, or your facebook page, or find something. They just have to pull out that card. M: That’s just it, I want to reiterate something here that people have asked me, like why can’t I just have my video on YouTube and just pull it up at a networking event. And I’m like okay, go ahead, you can do that, sure. But is that going to get someone to say, holy cow! How are you doing that? Oh my goodness! Is that going to get that kind of wow factor reaction? AR is that ability to make that instantaneous connection and wow factor and get people to disrupt their way of thinking. In that moment of disruption, is a tremendous opportunity for us to really, really make that connection that is not just going to be, ‘oh that was cool, see you later.’ It’s going to be more of an ‘oh! !’ In fact I have a story, do I have time to share a quick story? M: Ok. I got a call from a gentleman that said that when he got back from a 3-day medical convention in Florida. He’s from New York. He said the day after he got back to New York, he’s sifting through like hundreds of business cards, and only one stood out to him. And I said it was the one that came alive wasn’t it. And he said ‘yes,’ because when I saw that card, there was a young man at the convention showing people his business card and how it came alive with AR. This guy who was calling me said that he was so taken back by it that he called his colleagues across an incredibly crowded room, yelled across the room, ‘guys you have to see this, it’s amazing! He waved his arms across the room to get them to come over and witness it. So people are now causing a scene, people are swarming around this guy that has this business card that he is demonstrating who he is, and what he can do in his capacity, and he’s drawing an audience. You don’t just get that showing everybody a video that you just made on YouTube. J: No, and in fact, how you were describing that, was almost like going viral in person. M: Exactly! So when I say buzz factor or get people to stop in their tracks, it is amazing the kinds of reactions we get. I’ve had multiple people tell me that when they witness my card come alive, they felt weak in the knees like they were going to fall on the floor. That’s the kind of reaction you can get with AR in this capacity. And there’s a window of opportunity right now where not too many people have seen this! But in a couple of years, the wow factor won’t be as strong, so then we as business owners need to realize that this technology, that this AR is being considered a core technology. According to Apple, Google, Facebook. They all are building platforms so that developers can have more access to this technology which means everything moving forward from today on, we can expect more and more virtual elements around it. So if you’re not doing video marketing, it’s a good place to start. If you want to have the same power that video marketing can provide you online but you want to have that power offline, then AR is definitely a very simple way to make people be blown away by who you are and provide that experience that is so top of mind, people will be bragging about you for months to come. There’s a window here, and if we as business owners don’t realize it and grab hold of it, then it’s going to be gone and before you know it, all of your competitors are going to be incorporating AR, VR or some form of mixed reality into their marketing campaign and you’re going to be sitting there scratching your head saying, ‘well what happened?’ It really is, something that we need to be aware of, and hopefully start implementing in even baby steps. And that’s what REVEALiO is all about. J: So let’s talk about this a little bit, you know, some businesses may be sitting out there, some people may be sitting out there saying, this sounds great for XYZ business, but this may not work great for my business. Can you talk about which businesses you have seen this work really well for? Or how they’ve implemented it other than what we’ve already talked about? Yeah sure. So if you are in a business, and you have a message, you have something incredible to share and you know that maybe it needs to be explained a little bit or shown a little bit before people really understand the value of it, then this is really a great tool. Because, again, it gives you the ability to demonstrate who you are and what you can do for somebody without having to just use your words. So it really does cross multiple verticles. It really has to do with you as a business owner. Are you looking to get people to notice you? Or are you okay with where you’re at? It’s really super great for anybody who is in the visual arts field because it visually demonstrates the quality of your work. Even hairdressers can use this to show some before and afters, or even gather some testimonials bragging about why they are the best hairdresser in this particular region, you definitely need to go to them. I mean that’s powerful right? As a hairdresser. We’re all dealing with oversaturated markets, so if you want to set yourself apart and instantly connect with people, potentially even give them the ability to go through the entire buyer’s journey in less than 60 seconds, this is the only tool out there that allows that to happen in person. It’s amazing. J: It really is. Because not only that, and this is something I want to talk about, with your product REVEALiO, one of the things that you mentioned earlier, and we may to have much time before the break, but I just wanted to set it up, you mentioned that before when you talked about how you’ve introduced it to others and how it was the only card that they kept, and they always check it to see if you’ve updated your video, I think that's one of those things that we need to talk about too, and we’ll do it after the break; is how simple is this to change out? And how simple is this to use as a business owner? And how do we get that message out that a message has been changed? So when we come back, let’s start with that. Okay Michelle? J: Welcome back to Marketing That Won’t Break the Bank. So before the break, Michelle Calloway, who’s the founder and CEO of REVEALiO and I were talking about AR and marketing and how you can start incorporating it into your business and how it’s actually a great tool to use offline rather than online. So Michelle, we were talking about the fact that, you have mentioned that fact that you had somebody mention that your card was the only one they kept because they wanted to see when you updated your videos and all that sort of stuff. And I think we need to start describing how businesses can start to use this technology, and in my conversations with you, I know that this isn’t just a one shot deal, it’s not a one video and done, and the next time you print, you change the video. How does this all work? M: So first of all, we will work with you as the business owner, so the thing about REVEALiO is that we don’t expect that you are going to have all of the answers. We want to consult with you, we want to create with you, we want to hold your hand through the creation and strategy process of whatever campaign you’re going to create. So what we’ll decide is what is the best use of a REVEALiO for you. Is it your business card, or are you and author? Are you promoting a book? Maybe we make the book cover come alive. Are you an artist? Musician? Then you’re promoting your CDs, but then I say your CDs are becoming outdated very quickly. But you still end up giving something to somebody to walk away with so that they remember you by it and hopefully remember you by it right? So we can make any image or object come alive. But we tend to stay with more or less; flat printed marketing material. It can be a logo, it can be a logo that you repurpose on your door, your t-shirt or your table cloth. We will work with you to determine what is best for your campaign image wise we will use to connect a video to. And then the video is meant to be a 60 seconds or less intro video. It’s meant to be a teaser the videos are short. Live I said, they are to serve the wow factor, a little influence in the tool to get them to take an action. So the connection happens when you, the business owner provides us with your artwork and your video and we can assist you with those elements within the creation process and then we make the connection happen. Once the connection has happened, you are free to start to use the REVEALiO app to make your content come alive, using your logo, your book cover, or your business card. But also, we provide you with the ability to go in on a regular basis; in fact, anytime you want, and change out your video on a regular basis and edit your CTA buttons, and also see how often your Reveals are being viewed. That is a new model we just rolled out in February that we are excited about. We have received a tremendous amount of response from business owners, they love that power. So that is just easy peasy, you get access to a dashboard of your REVEAL and you can go in a change it up anytime you want. J: Oh, okay so this is really interesting. So not only do you just putting together a video, you can actually see how many times it has been viewed, how many times your CTAs have been clicked, and if you change out your videos, you can see which videos had the best bang for your buck. Is that what you are saying? M: Well, all of that analysis can potentially be done, but right now we’re in our younger years so the more or less we’re able to show you how often your Reveals are being viewed. When you swap out a video, at this time, you’re going to be responsible for checking to see, when you swapped out your video, did that increase your views. The deeper analytics can come as my company gains more funding and we continue to grow. But right now, we can at least see how often the REVEAL is being streamed or viewed. J: That is really cool. So in your experience, how often do people change out the video? M: It really depends on how aggressive the business owner is. I’ve had people swap it out probably once per quarter. It just depends on the campaign they are running as well. The CTA buttons are a lot easier to swap out than the video. Like if all of a sudden you realize that ‘oh!, I’m an affiliate of REVEALiO now, and so I want people to see as soon as my business card comes alive, I want them to go straight with my affiliate link in there. I want them to go straight to purchasing a REVEALiO or signing up through REVEALiO as an affiliate themselves, and then my link was built into that link CTA button that would appear on the mobile phone. So there’s ways you can go in there and edit the CTA buttons, again, so that you are driving them to different pages on your landing site, if you have a different get you offering now, you can just swap that out so easily. J: So let’s talk about those CTA buttons. How many can you put on a video? And what are the different ones that you have set up? M: You’re allowed to have up to four, you need to at least have one because you need to give your viewers something to do next. So there’s nine to choose from. We have a, obviously a website button, which is universal, we keep them very universal icons - www, and then we have a buy now button, that looks like a shopping cart. We have a gift icon so that you can turn your business card or book into a gift card, essentially giving people added value to incentivize them to download the free app so that they can take your card or your book home and show other people how it comes alive with REVEALiO. So you can also have a, email button, so that they can go straight into the email browser on their phone. You can have them have it text you, you can have them share your content, your business card, your book cover, whatever it is, the object that you are imaging -- sorry, whatever the image is that they are viewing through the REVEALiO, when they tap on the facebook button or twitter button, they can share that on their social media wall and brag about the fact that it just came alive. So there’s that shareability, that exponential, shareability, biocapacity potential of the REVEALiO as well. And then we also have a schedule now button. You can have somebody go straight into your calendar and book an appointment with you based upon their REVEALiO experience. J: Okay, so is that through an app that you are using or can that be through Calender, or whatever calendar app they use? M: Yeah so whatever app that you would normally send someone through to your calendar, that connects the button to your calendar. J: Okay, okay so here’s the other question; you know we’ve been talking about the fact that we’re using it on print materials, so postcards, business cards, fliers, that sort of stuff. But you just said that you can share it on facebook or twitter, or whatever. Does that mean that the image that you are using, you can also put on online applications REVEALiO will actually come alive from there as well? M: So let me show you for instance, you have a business card, that’s activated in REVEALiO. And somebody watched your business card come alive, and they tap on facebook share. The image of your business card gets shared on their social media wall. It can be viewed through a mobile device through that social media share, on a computer screen, and it will still work. It will still play on top of the image on the computer screen, as long as you are viewing it through the mobile screen. So there is that capacity of making it come alive, in the digital realm. But you’d have to view it through the mobile screen. Yeah, but the neat part is that your viewers can brag about the fact that it just came alive, and hopefully intrigue them, make it a contest to see who among your viewers shared your content to see how many people they can get engaged. You can make it a game. We always get the question, well how to do I get people to download the free app? And I say, incentivize them. Make it an added value. Don’t make it all about promotional, promotional, promotional. Make it about them and provide an experience this is going to provide them a lasting memory and a warm feeling like ‘I really like this company, I want to do more business with them. They’re really super forward thinking and cool and they provided the experience for me and I’m going to remember this for a lifetime, I’m going to brag about them.’ You know that brand loyalty. J: I agree with you and that was kind of going to be one of other questions. Since they are going to need to have an app to use this, have you found any resistance in downloading that app to get people to use it and all that sort of stuff? And you chuckle so there’s a story there. M: There’s always a story. About 40% of the people that I come into contact with when I demonstrate this, especially at networking events where they’re more business minded people, about 40% of them will download it on the spot. As soon as they see it, they’re like what is that? I want to do this. And they want to test it for themselves. They want to hold the card in their hand and watch it come alive. So 40%. The others, well what I recommend you do is that you demonstrate that you have the power in your hands to do this. So business owners, if you’re going to use REVEALiO, or AR, don’t hand somebody something and say ‘go download this app’ and watch this thing happen, demonstrate it for them. They aren’t going to understand since it’s new. So it’s best when demonstrated in person if possible. Or at least demonstrate it online via a video showing how it works. Right? So once people have seen it in action, then you can incentivize them to download the free app by making it a game or by giving them something of value for taking the time to download it. So you can give them a free gift that is of value to them if they download the free app. Or you can say ‘enter the drawing to win this grand’… make up this huge gift!! Incentivize them to take the time to download the app, watch your card come alive, and that provides them that wonderful impact and influence, because they are doing it themselves. Then give them a way to be rewarded. Make it a game. I play treasure hunts all the time when I speak on stage. I have my audience participate in a treasure hunt. 70% of the room converts to my sales funnel just by having them want to participate in a treasure hunt. And that’s through a two-step verification process. J: That’s just incredible. It’s one of those things and I’m sorry we don’t have video for this but it is just one of those things that you have to see, to see the power of it. But Michelle, what types of, you mentioned authors, and you have mentioned putting it on books, and some other things. But what are some of the other unique ways that you have seen people use your software or process? M: If you’re going to have an event and you are going to mail out event invitations, that is a really warm and memorable way to engage those people to come and attend your event. You’ve given them an even more of a wow factor about your event. You can use your…. If you’re going to send an event invitation, you can use a part of it come alive, you can do a warm invitation video in there, but also give them a little taste of what the event is going to hold for them. You know what they can anticipate, it’s that tease, you know, so events, there’s some really good use cases for events. So at the event, offering people to have an opportunity to have different experiences throughout the room, throughout the event. How wonderful, when you walk into an event and you know that everything around the event comes alive with maybe a different message. You know, I see art museums. Some art museums are using this as a means to provide more information about the artist. So you’re looking at a piece and you’re wondering what was behind the inspiration of that? And you can just hold your app over the visible side card and have the little side card and have it come alive with a message from the artist. I mean, there are so many different ways, that authors, 90 year old authors are using this technology to demonstrate who they are and what their book is about. And 90 year olds, so this is not something for the young, it is definitely for everybody. It's just a wonderful warm way to engage your audience. So I really don’t… what I’m getting a lot of is that there are video companies using it as a means to differentiate themselves to get people to use them for their video services because they are able to visually demonstrate the video quality of their work, and we’re always looking for more business partners to partner with. REVEALiO is a B2B, but we also do B2C because it’s for everybody. But business owners can definitely use it to differentiate themselves from their competition. J: Okay, so hold that thought because it’s time for our last break and when we come back, we’re just going to finish up our discussion on REVEALiO and AR marketing. So stay tuned. J: Welcome back to Marketing that Won’t Break the Bank, so today, Michelle Calloway and I have had a great discussion on AR and how to incorporate it into your marketing strategies. So Michelle, I have just one last question before be just start to wrap up. But that is, what is the number one piece of advice you would give to business owners about AR today? J: Okay? Can you expand on that? M: Don’t ignore it. If you had the chance, if you knew how big of a smash hit Pokemon Go was going to be, and you had an opportunity to get in somehow and figure out how to monetize a little portion of that billion, billion dollars that came from that, wouldn’t you have loved to have known? And taken the time to get involved? Now is the time to get involved with AR. If you don’t pay attention to it, it could be too late and the barriers will become too high. SO now is the time to pay attention. J: Yeah, I really love that advice because there’s so many… particularly small business owners, who hesitate to start using new technology and new ways to market to your audience, when its just starting to come up on the market because they have this wait and see mentality, but I totally agree with you. This is one of those things that’s taking your video marketing that you’ve already been doing hopefully, and on Marketing that Won’t Break the Bank, we have spend a lot of time over the last couple of months talking about video marketing and just taking it to the next level. And not only doing it online, but also as part of your in-person one-to-one type conversations that you’re having each and every day. M: Yes. We are finding consumers are calling it the demand generation. They are coming to the table already with the knowledge that they need. Now they’re looking for that experience that’s going to help them decide whether it’s you, or your competitors that they are going to work with. J: Yeah. And really, that’s where the rubber meets the road. Because so many of us, me included, are seeing these technologies and in some ways, getting overwhelmed with it, and not doing anything. Then seeing the train go right by us, and saying gosh darnit, I wish I got on there. M: That’s exactly where I come from. I come from a small business background. So for small business owners, ‘I got you.’ That’s why I made this incredibly simple. To take all the pain points away from you, I do it for you. It’s so easy, you just call me or email me or go to our website and purchase one of our packages and we’ll take care of you. We will not expect you to do this for yourself. We will take care of you and make it happen. So all you have to do is just go out there and dazzle people with who you are and what you have to offer. J: Yeah, and I really think that is great and you and I have been going through the process and it seems as simple as Michelle is saying. So I really love this and I hope that we’ve been able to convey some of that energy that both of us have for this technology. And Michelle, who have you seen that has taken this and done spectacularly well with REVEALiO and AR right now? M: Well we are young so I have had video marketers have said that this is a great tool that allows them to set themselves apart from competitors. And then I have had graphic book designers out there using it. I just got somebody brand new in the real estate industry starting to use it. And the feedback I’ve been getting back has been wonderful. We’re really new and young so we haven’t got the tremendous amount of data backing up the actual purchases that are coming from us. But I do know that the influence factor and the wow factor is playing pretty strong. It’s a really high level of impact and influence. So I’ve now got a Disney imagineer, somebody who’s very connected into that Disney sector. She’s down there, going around, showing everybody, and dazzling everybody with it. So I’m excited to see how many speaking engagements it gets her. So everybody is using it for different purposes. But all I can tell you is that the feedback I’m getting back is incredibly excited, incredibly excited people. J: Well yeah, exactly. And I can’t wait to get mine up and running. And we’re going to get that done here soon. The other thing too Michelle is that we’ve talked about… you’ve just mentioned real estate agents. And that’s one of the markets that I do work with. And I would see this as one of those things that if you’re promoting a house, or a property for sale, it would be such a great way to just go in and do a 360 view of the house or something like that to make sure that you can sell that house. M: See what this technology can do when you demonstrate whether you introduce yourself before you show them property, or you go straight to showing a property from your business card, or from your yard sign. Just giving people that power means people will be back, no doubt. J: Exactly, so Michelle, Michelle, thank you so much for joining us today and I wanted to give you an opportunity, if you have some way that people can contact you, or if you have something that you would like to give our listeners today, this is your opportunity to just let us know how we can start working with you. M: Yes Janet, thank you. If you would like to get a hold of REVEALiO and ask some questions on how you could use it in your business, just write to info@revealio.com and it’s the word ‘reveal’ -’io’ -’.com.’ revealio info, info@revealio.com. And if you are interested in actually using this as a tool for yourself, I am making the incredible offer for today, for having me on the show and you can go to revealio.com/special and you can see the special pricing we’ve made available for you there. You can do a one-time setup fee, or you can actually do a subscription model. That is available to you there at revealio.com/special. Other than that Janet, I’m full service, I can give a free consultation. Don’t think you have to figure this out all on your own. This is new, this is edgy, this is different, and once you see exactly how simple it is, you’re going to love, love, love it. And the idea of what it can do for you, when you’re out and about networking, there’s nothing else like it. J: Thank you so much Michelle, and I hope you’ve all enjoyed our conversation today. If you want to contact me or if you have any questions, just let me know at janet@411marketingsolutions.com. Next week, we’re going to talk about how to bring out the author within you. My guest is Suzy Pruden who is the co-creator of Iddybiddy Publishing. She’s going to explain the power of being a published author, how it can affect your business and really what it takes to get there. So I hope you’ll join us next week and I thank you today for joining Marketing that Won’t Break the Bank. Don’t forget to join us in our facebook group. Marketing that Won’t Break the Bank podcast, and have a great week. See you on the flipside.